A YouTuber going by the name RossCreations is one of those loathsome channel operators that doesn’t really understand what a prank is. 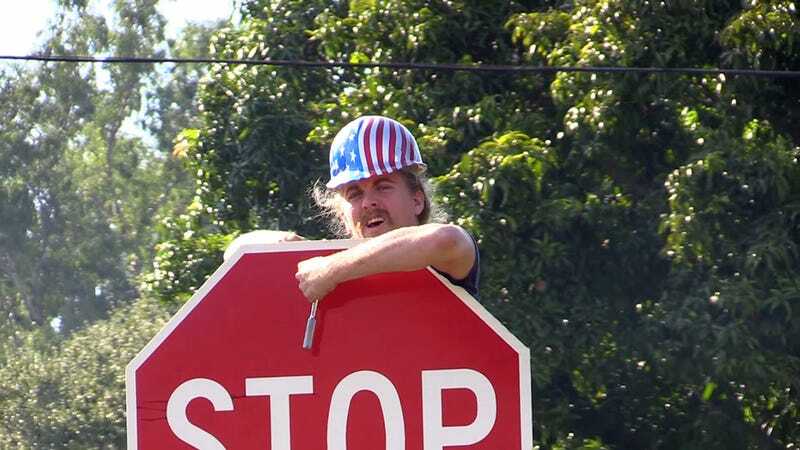 Recently, he removed some stop signs that he deemed “unnecessary” and now, he’s been arrested. In a video published to his channel today, Ross is pleading with his half a million subscribers to donate to his legal fund. It appears that he realizes what he does isn’t really about pulling off pranks, it’s about doing stupid things. The stupid thing that landed him in jail was dressing up as a road worker and removing two neighborhood stop signs. In the video, he and his friends laugh as cars go through the intersection without stopping. And... that’s it. For whatever reason, someone determined that the intersection needed a stop sign for safety reasons; he decided that it didn’t, and the prank is over. It doesn’t seem that anyone was hurt, but Ross claims in the video that he’s charged with third-degree felony grand theft and faces up to five years in prison. He wants his fans to chip in and help get him out of this trouble. Not only is this just stupid, it might be a violation of YouTube’s community guidelines. “Harmful or dangerous content” is prohibited and this could certainly be construed as promoting dangerous behavior. Ross is one example of a trend that’s been building in YouTube land. Many people have started to think that cruelty and stupidity constitute a prank. Sam Pepper is one example—he “pranked” a friend by kidnapping him and pretending to murder one of their mutual acquaintances. Most recently, a couple lost custody of their kids after posting a series of “pranks” in which they repeatedly abused their children. Mark Hamill sneaks up on Star Wars fans who think they’re auditioning for some Star Wars event. As the fans reenact the scene when Vader reveals he’s Luke’s father, Hamill comes in and does his best rendition of the “noooooooo!” It’s nice. People are startled, then elated. They were briefly deceived but they were able to meet a hero. And it all helps promote a charity drive for UNICEF and the Starlight Children’s foundation. You can donate some money and win lunch with Hamill or see The Last Jedi early. Good prank, good cause, look at me linking to it. What you won’t find in this article is a link to Ross’ legal fund or an embed of his video. There are links if you insist on watching him commit a crime and subsequently get arrested for it. The arrest part is kind of funny.